I apologize if this thoroughly confuses everyone, but studying my analytics the other day, I was reminded that nobody reads blogs on Friday. (Well, not nobody, because obviously you're here, right?) That said, I've decided to make a radical change here at VKBMKLs and do away with Update Wednesday and instead christen Update Friday. Exciting, no? Once again on Wednesdays, you will see new reviews, while Fridays will be reserved for updating those posts I used to do way-back-when that only had one crusty old scan. That said that said, welcome to Update Friday... and it's probably gonna be the most exciting Update Friday of all because I happen to be updating a book my good friend gef introduced me to... a book that I think stands at the top of the heap as far as vintage books goes. A book that every single child in the entire world should be familiar with. 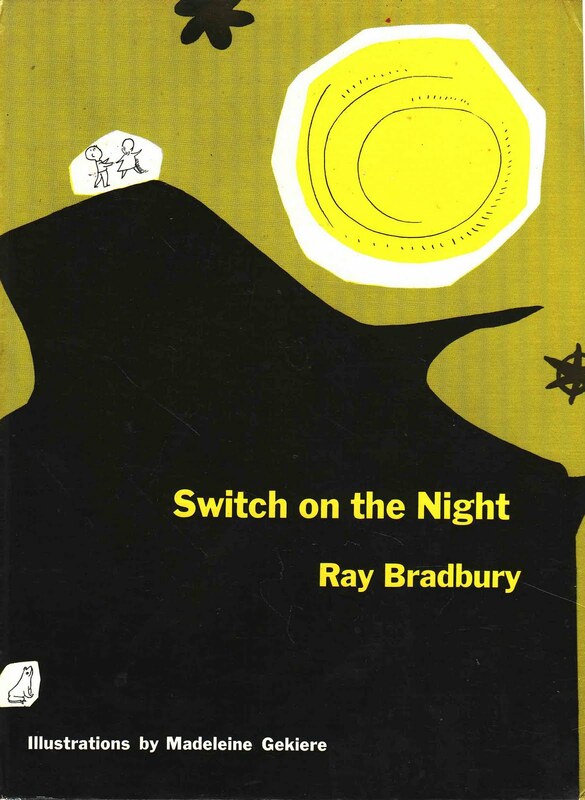 The original version of Ray Bradbury's Switch on the Night, his one and only picture book for children. I can not recommend this book highly enough. Simply brilliant. Thanks for the email- looking forward to it! Huh, I didn't know it had a different original cover. I have the version that was drawn in the 90's, I think. You've convinced me that I need to find a copy promptly! On a separate note, I'm about to make a purchase through Amazon. I seem to recall that if I access Amazon through your website, you get some minimal fee. Sometimes my husband and I add items to our Amazon cart over a period of time before eventually purchasing the items. Is it enough if I access Amazon through your site at the time we make the purchase, or do the items need to be added to our cart via your website in order for you to get any credit? Does that question make sense? And you get something even if our purchases are not book-related, right? I love your blog and would like to support it in this small way. I regret that too often I forget to do so. Maybe you could remind your other readers as well. You are so sweet. I don't think it really matters as long as you go in through here.... Thanks a ton... it's the thought that counts! Just found your blog! I'm in LOVE! I'm linking up at http://www.onthelap.org a literacy blog. Please stop by anytime and I'll be linking up again I'm sure. Oh, and I found you on Ohdeedoh!